Thank you for your love and support! We really hope you can attend the wedding and be part of this joyous occasion! If you cannot attend, your thoughts and prayers are appreciated. While your presence is the best gift of all, we realize that you may wish to give us a wedding present to commemorate our union. We look forward to merging our two houses into a home together and have already been so blessed with much of what we need. We are very excited about our upcoming honeymoon to Sedona, Arizona and have compiled a honeymoon wish list of experiences and activities that will create happy memories that we will always cherish! For more traditional items, we have created a small registry at Belk. As we begin the next chapter of our lives together, we have also started something of an international adventure. Living overseas presents some challenges, so to make things simpler for everyone, here's an idea we thought you might like. While we are on our travels, we can look back, smile and say it was thanks to you! "I can't wait to see you at my birthday. Please join Nick & I in celebrating the birth of our first child! Which by the way is a baby girl! We realize there are many things we need to get started with a brand new baby! We hope you can share in our celebration but ask you not to break the bank! So we've come up with a unique way to help us with the big ticket items and hope you'll enjoy! Registry: Baby Wood to be! Most things we need we've already got and in our home we can't fit a lot! A wishing well we thought would be great but only if you wish to participate. We know that this strays from traditional gift giving "etiquette" if you will, but have also come to the realization that if you know us well enough, you will not be offended - instead excited to know that your gift contributions will help send us on the best honeymoon ever. even more than a soup tureen... an unforgettable, dream wedding in Italy. (to attend the wedding of the friend that introduced us no less!). needed post-wedding R&R... April is going to be a fabulous month for us! So, even though your presence is more valuable to us than your presents, if you wish to give a gift, there are a number of things below that we'd be delighted for you to contribute to. For our more traditional guests who'd like to give us something that we can keep, we've also listed the the remaining items of the china and crystal sets we have been collecting since our engagement. There is also some useful information on travel, accomodation, what we'll be up to and what to do in the area on the tabs to the left of the screen. We hope it answers most of your questions, but please just ask if you have any more! 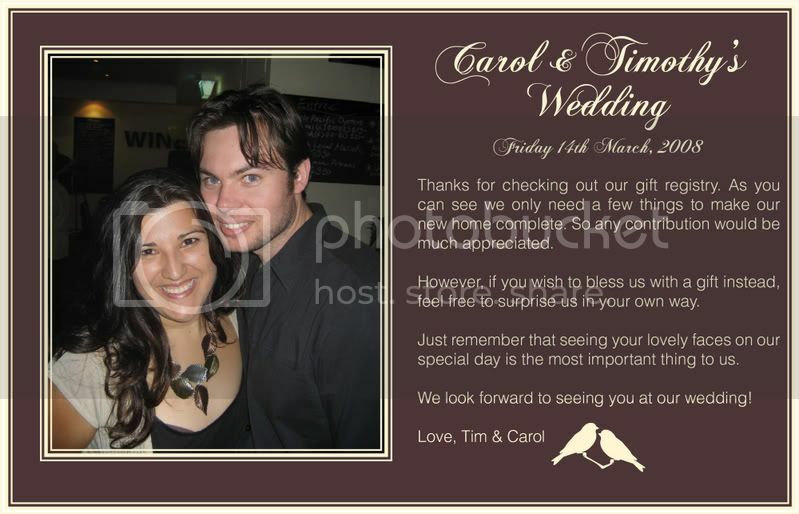 Thank you for visiting our site, we look forward to seeing you at the wedding. Thank you for visiting our wedding registry. Many of our friends and family have asked for gift suggestions. As we already have many of the items we need to start our new lives together, we have created this registry for those who wish to participate.